"At the Back of the Front: Dunkirk and Ypres." 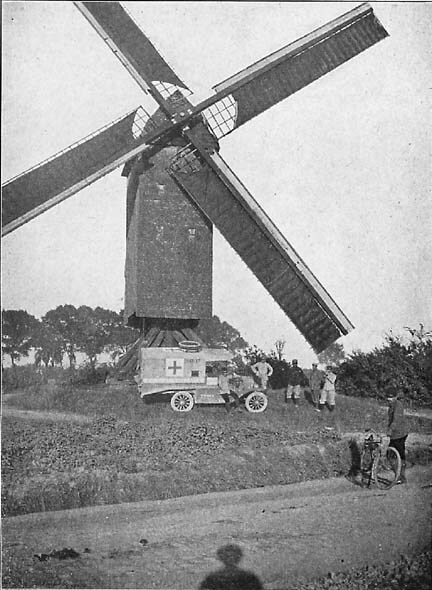 IN June, 1915, it was the pride of the Section in Flanders, Section 1, to feel that it had come closer to war than any other division of the American Ambulance. In June, 1916, the point of pride is to know that those first intense experiences have long since been duplicated and eclipsed. The competitive principle does not enter, naturally; the significance is that in this twelve-month the service of the Americans has been steadily extended and vitalized. And in at tempting to express here something of the whole through one of its parts, I need only suggest that the initial adventure in the North, comprehending in a few crowded weeks a fairly full range of experience behind the lines, perhaps still stands as typical and illustrative of all the rest. In Dunkirk we witnessed, and within our powers tried to cope with, what yet remains, I believe, the most sensational artillery exploit in history. It is remembered that the little cars of the Americans often ran those empty streets, and pursued those deafening detonations, alone. Here, at our base, we shared the life of a town under sporadic, but devastating, bombardment; forward, in Elverdinghe, we shared the life of a town under perpetual, and also devastating, bombardment; still further forward, in Ypres, we beheld a town bombarded from the face of the earth in a single night. We shared no life here, nor yet in Nieuport, for there was none to share. In the salient around Ypres, we played for many days our small part in that vast and various activity forever going on at the back of the front. Here we saw and learned things not easily to be forgotten: the diverse noises of shells going and coming, of arrivées and départs; the stupendous uproar of the "duel" before the charge, which makes the deepening quiet of a run-back come like a balm and a blessing; the strange informality of roadside batteries, booming away in the sight of peasant families and every passer; the silence and the stillness, and the tenseness and the busyness, of night along the lines; the extreme difficulty of hiding from shrapnel successfully without a dugout, the equal difficulty of driving successfully down a shell-bitten road in darkness like ink; the glow against the sky of a burning town, and the bright steady dots of starlights around half the horizon; the constant straggle of the evicted by the field-ambulance's front-door, and the fast-growing cemetery at the back-door; the whine and patter of bullets by the postes de secours and the business-like ripple of the machine-guns; the whir of Taubes, the practical impossibility of hitting them from the ground, and the funny little bombs sometimes dropped by the same; the noises made by men gone mad with pain; the glorious quiet of men under the acetylene lamps of the operating-table; "crowd psychology," and why a regiment becomes a "fighting machine," and how tender hearts are indurated with a toughening of the skin; the high prevalence of courage among the sons of men; drawbacks of sleeping on a stretcher in an ambulance; the unkemptness of Boche prisoners; life, death, and war, and the values and meanings thereof. Such things, as I know, passed into the experience of Section 1, in Flanders. And these things, and more, have similarly passed into the experience of scores of young Americans since, in their life and service behind the lines of France. It is the composite experience which the following pages narrate; it is the composite service which the mind holds to with most satisfaction. We were the Service Sanitaire Américaine: a proud title, and we wished, naturally, to invest it with the realest meaning. That in this year 1915-16, the American service has been rendered efficiently and even valuably, this volume as a whole attests, I think. That it has been rendered with the requisite indifference to personal risk is also, I hope, supported by the record. A transient in the service, who by no means bore the burden and heat of the day, may be permitted, I trust, to say these necessary, or at least these interesting and pertinent, things with complete detachment. I remember the hour of Section 1's "baptism of fire." We stood in the lee (or what we hoped was the lee) of the Petit Château at Elverdinghe, while German shells whistled over our heads and burst with a wicked crash about the little church, the typical target, a couple of hundred yards away. (What interest we felt when a fragment of shell, smoking hot, fell almost at our feet, and what envy of the man who gathered in this first memorable "souvenir"!) We were just down from Dunkirk; we were greener than the grass that blew; and that the novel proceedings were acutely interesting to us will never be denied. Perhaps each of us secretly wondered to himself if he was going to be afraid; certainly all of us must have wished, with some anxiousness, that those strange whistles and roars would turn themselves another way. And still, when the young Englishman who ran the ambulance service there appeared et that moment and asked for two cars to go down the road to Brielen (which was to go straight toward the trouble), it is pleasant to remember that there was no lack of volunteers, and two of my companions were cranking up at once. There was never any time later, I am sure, when the sense of personal danger was so vivid in the minds of so many of us together. Every ambulance-driver must have his bad quarters of an hour, no doubt---and some of the worst of them may concern, not himself at all, but his car or his wounded. And if it is said that these young Americans, amateurs and volunteers, have acquitted themselves well in sometimes trying circumstances, there is no intention to overemphasize this aspect of their service. A volume might be written on the developmental reactions---all but mathematical in their working---of war-time. Nor does it seem necessary to add that the risk of the ambulanciers, at the worst, is small in comparison with that of those whom they serve, and from whom in turn they get their inspiration---the intrepid youths in the trenches. We came to know these youths very well---the gallant and charming poilus who have so long carried the western front upon their shoulders. We sincerely admired them; and on them largely we formed our opinions of France, and of the war generally, and of war. From the standpoint of observation, indeed,---and doubtless it is observation one should try to record here,---I believe we all felt the peculiar advantage of our position to have been this, that we mingled with the soldiers on something like equal terms. We were not officers; we were not distinguished visitors dashing up in a staff-car for an hour of sight-seeing. We were rankers (so far as we were anything), and we were permanent; and in the necessities of our work, we touched the life of the common fighting man at every hour of the day and night, and under almost every conceivable circumstance. We were with the poilus in the hour of rout and disaster; we were with them in the flush of a victorious charge brilliantly executed. We crawled along roads blocked for miles with them, moving forward; we wormed into railroad stations swamped with the tide of their wounded. Now we heard their boyish fun, and shared their jokes in the fine free days off duty; and now we heard, from the unseen well of the jolting car, their faint entreaty, Doucement, doucement! We saw them distressed by the loss of their precious sacs, or elated by the gift of a button or a cheese; we saw them again, in silence and the darkness beside the Yser, very quiet and busy, with the ping and whine of many rifles; and again we found them lying on straw in dim-lit stables, bloody and silent, but not defeated. Now they gave us tobacco and souvenirs, and told us of their gosses, and helped us tinker with our cars, about which some of them, mechanicians in happier days, knew so much more than we did; and now they died in our ambulances, and sometimes went mad. We saw them gay, and we saw them gassed; we found them idling or writing letters on the running-boards of our cars, and we found the dark stains of their fading lives upon our stretchers; we passed them stealing up like stalwart ghosts to action, and we left them lying in long brown rows beside the old roads of Flanders. And to me at least it seemed that the dominant note and characteristic quality of the poilu, and all his intense activity, was just a disciplined matter-of-factness, a calm, fine, business-like efficiency, an utter absence of all heroics. Of his heroism, it is superfluous to speak now. My observation convinced me, indeed, that fortitude is everywhere more common and evident, not less, than even rhapsodical writers have represented. There seems literally no limit to the powers of endurance of the human animal, once he is put to it. Many writers have written of the awful groanings of the wounded. I must say that, though I have seen thousands of wounded, the groans I have heard could almost be counted upon the fingers of my hand. Only once in my experience do I remember seeing any signs of excitement or disorder. That was in the roads around Poperinghe, in the first threatening hours of the second battle of Ypres. Once only did I get any impression of human terror. And that was only a reminiscence, left behind by women and children in the tumbled empty houses of Ypres. But in all the heroism, unlimited and omnipresent, there is observed, as I say, little or no heroics. That entire absence of drum and fife, which strikes and arrests all beholders at the front, is significant and symbolic. These men muster and move forward to the risk of death almost as other men take the subway and go downtown to business. There are no fanfares at all, no grand gestures, no flourishes about the soul and "la gloire." It is true, no doubt, that the ambulance-driver views the scene from a somewhat specialized angle. His principal association is with the sequels of war; his view is too much the hospital view. Yet, it must be insisted, he becomes quickly and strangely callous on these points: and on the whole would be less likely to overstress the mere horrors than someone who had not seen so much of them. On the other hand, as I have suggested, he has extraordinary opportunities for viewing war as a thing at once of many parts and of a marvellously organized unity. Personally, I think that my sharpest impression of war as a whole came to me, not along the postes de secours or under the guns at all, but at the station place, in the once obscure little town of Poperinghe, on April 23, 1915. That, it will be remembered, was a fateful day. At five o'clock in the afternoon before (everybody was perfectly specific about the hour), there had begun the great movement now known as the Second Battle of Ypres (or of the Yser). 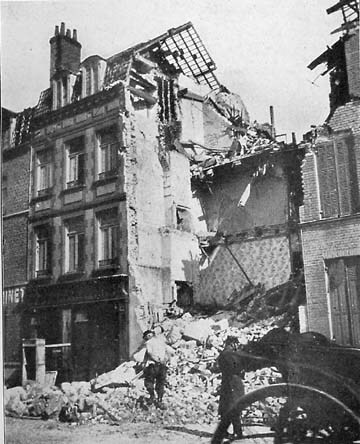 The assault had begun with the terrifying surprise of poison-gas; the gas was followed by artillery attacks of a ferocity hitherto unequalled; Ypres had been wiped out in a few hours; the Germans had crossed the Yser. Thus the French and English lines, which were joined, had been abruptly pushed back over a long front. That these were anxious hours for the Allies, Sir John French's report of June 15, 1915, indicates very plainly, I think. But they were far from being idle hours. To-day the whole back country, which for weeks had swarmed with soldiers, was up. For miles around, Allied reserves had been called up from camp or billet; and now they were rushing forward to stiffen the wavering lines and stem the threatening thrust for the coast. At three o'clock on this afternoon, I stood in the rue d'Ypres, before the railway station in Poperinghe, and watched the new army of England go up. Thousands and thousands, foot and horse, supply and artillery, gun, caisson, wagon, and lorry, the English were going up. All afternoon long, in an unending stream, they tramped and rolled up the Flemish highroad, and wheeling just before me, dipped and disappeared down a side street toward "out there." Beautifully equipped and physically attractive---the useless cavalry especially!---sun-tanned and confident, all ready, I am sure, to die without a whimper, they were a most likely and impressive-looking lot. And I suppose that they could have had little more idea of what they were going into than you and I have of the geography of the nether regions. This was on my left---the English going up. And on my right, the two streams actually touching and mingling, the English were coming back. They did not come as they went, however. They came on their backs, very still and remote; and all that you were likely to see of them now was their muddy boots at the ambulance flap. Service Sanitaire as we were, I think Section One never saw, before or since, such a conglomeration of wounded as we saw that day at Poperinghe. Here was the railhead and the base; here for the moment were the Red Cross and Royal Army Medical Corps units shelled out of Ypres; here was the nervous centre of all that swarming and sweating back-of-the-front. And here, hour after hour, into and through the night, the slow-moving wagons, English, French, and American, rolling on one another's heels, brought back the bloody harvest. The English, so returning to Poperinghe gare, were very well cared for. By the station wicket a large squad of English stretcher-bearers, directed, I believe, by a colonel of the line, was unceasingly and expertly busy. Behind the wicket lay the waiting English train, steam up for Boulogne, enormously long and perfectly sumptuous; a super-train, a hospital Pullman, all swinging white beds and shining nickel. The French, alas, were less lucky that day. Doubtless the unimagined flood of wounded had swamped the generally excellent service; for the moment, at least, there was not only no super-train for the French, there was no train. As for the bunks of the station warehouses, the hôpital d'évacuation, they were, of course, long since exhausted. Thus it was that wounded tirailleurs and Zouaves and black men from Africa set down from ambulances, staggered unattended up the station platform, sat and lay anyhow about the concrete and the sand---no flesh-wounded hoppers these, but hard-punished men, not a few of them struck, it was only too manifest, in the seat of their lives. This was a bloody disarray which I never saw elsewhere, and hope never to see again. Here, indeed, there was moaning to be heard, with the hard gasp and hopeless coughing of the asphyxiés. And still, behind this heavy ambulance, rolled another and another and another. On my left was the cannon fodder going up; on my right was the cannon fodder coming back. The whole mechanics of war at a stroke, you might have said; these two streams being really one, these men the same men, only at slightly different stages of their experience. But there was still another detail in the picture we saw that day, more human than the organized machine, perhaps, and it seemed even more pathetic. Behind me as I stood and watched the mingling stream of soldiers, the little square was black with réfugiés. Farther back, in the station yard, a second long train stood steaming beside the hospital train, a train for the homeless and the waifs of war And presently the gate opened, and these crowds, old men and women and children, pushed through to embark on their unknown voyage. These were persons who but yesterday possessed a local habitation and a name, a background ---old ties and associations, community organization---a life. Abruptly severed from all this, violently hacked off at the roots, they were to-day floating units in a nameless class, droves of a ticket and number, réfugiés. I walked up the platform beside their crowded train. A little group still lingered outside---a boy, a wizened old man, and three or four black-clad women, simple peasants, with their household goods in a tablecloth-waiting there, it may be, for the sight of a familiar face, missed since last night. I asked the women where they came from. They said from Boesinghe, which the Germans had all but entered the night before. Their homes, then, were in Boesinghe? Oh, no; their homes, their real homes, were in a little village some twenty kilometres back. And then they fixed themselves permanently in my memory by saying, quite simply, that they had been driven from their homes by the coming of the Germans in October, 1914; and they had then come to settle with relatives in Boesinghe, ---which had seemed safe---until last night. Twice expelled and severed at the roots---where were they going now? I asked the question, and one of the women made a little gesture with her arms, and answered stoically, "To France," which was, as I consider, the brave way of saying, God knows. As the case seemed sad to me, I tried to say something to that effect; and, getting no answer to my commonplaces, I glanced up, and all the women's eyes had suddenly filled with tears. And outside the English were still going up with a fine tramp and rumble, nice young clerks from Manchester and greengrocers' assistants from Tottenham Court Road . I have never forgotten that the very last soldier I carried in my ambulance (on June 23, 1915) was one whose throat, while he slept, had been quietly cut by a flying sliver of a shell thrown from a gun twenty-two miles away. But it will not do, I am aware, to over-emphasize the purely mechanical side of modern war, the deadly impersonality which often seems to characterize it, the terrible meaninglessness of its deaths at times. Ours, as I have said, was too much the hospital view. That the personal equation survives everywhere, and the personal dedication, it is quite superfluous to say. Individual exaltation, fear and the victory over fear, conscious consecration to an idea and ideal, all the subtle promptings and stark behavior by which the common man chooses and avows that there are ways of dying which transcend all life,---this, we know, must have been the experience of hundreds of thousands of the young soldiers of France. And all this, beyond doubt, will one day be duly recorded, in tales to stir the blood and set the heart afire. Les Bombardements que nous venons de subir ont fait surtout des victimes dans les rues. Je recommande ESSENTIELLEMENT aux habitants de s'abriter dans les caves voûtées et de ne pas se fier même à des écarts de tir assez longs pour sortir. Dunkerquois, nous avons à supporter les risques de la guerre, nous les supportons vaillamment. Notre ville peut avoir à payer son tribut au vandalisme de nos ennemis comme d'autres villes, NOUS GARDERONS HAUT LES COEURS. VIVE DUNKERQUE TOUJOURS ET VIVE LA FRANCE. The bombardments to which we have been subjected have caused many casualties in the streets. I most emphatically urge all persons to seek shelter in vaulted cellars, and not to trust even to intervals in the firing long enough to go out. People of Dunkirk, we have to put up with the hazards of war, and we are doing so courageously. Our city may have to pay its tribute to the vandalism of our foes, like other cities; we will keep our hearts serene and high. The ruins alone will be German, the soil will remain French, and after the Victory, we shall meet again, stronger, more determined, and prouder than ever. Vivo Dunkirk forever, and Vive la France! And the best part of this ringing manifesto, as it seems to me, is that it is all quite true. Dunkirk will live long, and so will France; and after the victory the citizens will find themselves, we cannot doubt, prouder and more resolute than ever. In the immense burden which France is bearing, the sum of the service of the young Americans has been, of course, quite infinitesimal. As the most generous and sympathetic persons are always quickest to appreciate the intentions of sympathy from others, it is pleasant to know that the French, characteristicaIly, have not been unmindful of even this slight thing. But, it is truly said elsewhere, the real gainers from this relationship have been the Americans. Not only is this true; it seems to me there can be no surprise in it. There can be hardly any of these men who did not set out from home, however unconsciously, for his own good gain; hardly one who did not feel that if he could but touch this memorable making of history with however small a hand, if he could but serve in the littlest this so memorable cause, he would have a possession to go with him all his days. Quorum parva pars fuerunt; and --- from the little Latin all schoolboys remember --- hoec olim meminisse juvabit. This is theirs; and it is enough. But should any of them covet another reward than what they carry within themselves, I think they have it if this log-book of their Service seems to show that within their powers they have deserved the fine name here bestowed upon them, the Friends of France. Mon coeur à la France." The trenches in this part of the Vosges are cut along the brows of heights which directly overlook the Rhine Valley. From these summits can be seen, beyond the smoke which deepens the mist above the famous cities of Mulhouse and Colmar, the shadowy boundary of the Black Forest and the snow-topped mountains of Switzerland. A few yards behind the mouths of the communication trenches are the first dressing-stations, everywhere and always one of war's most ghastly spots. Paths make their way from these dressing-stations down the mountain-sides until they become roads, and, once they have become roads, our work begins. Nowhere else are foreign soldiers upon German soil. Nowhere else, from Ypres to Belfort, do the lines face each other in a mountain range of commanding summits and ever-visible village-dotted valleys. Nowhere else can one study in history's most famous borderland both war and one of those problems in nationality which bring about wars. And surely nowhere else are Detroit-manufactured automobiles competing with Missouri-raised mules in the business of carrying wounded men over dizzy roads. Until our light, cheap cars were risked on these roads a wounded man faced a ten-mile journey with his stretcher strapped to the back of a mule or put on the floor of a hard, springless wagon. Now he is carried by hand or in wheelbarrows from one half to two miles. Then in one of our cars there is a long climb followed by a long descent. And over such roads! Roads blocked by artillery convoys and swarming with mules, staggering likely as not beneath a load of high-explosive shells! Roads so narrow that two vehicles cannot pass each other when both are in motion! Roads with a steep bank on the one side and a sheer drop on the other! Roads where lights would draw German shells! Roads even where horns must not be blown! Indeed, these roads seem to stand for our whole work. But they do not by any means represent our whole work, and it is necessary, if one wants to convey a comprehensive idea of our life, to begin at our base. This is a village twenty-five miles to the rear, but strategically located in relation to the various dressing-stations, sorting-points, base hospitals, and railheads which we serve, and, in this war of shipping-clerks and petrol, one of those villages which is as much a part of the front as even the trenches themselves. It is a "little, one-eyed, blinking sort of place." It is not as near to the fighting as some of us, particularly adventurous humanitarians fresh from New York and Paris, desire. But, picturesquely placed on the banks of the Moselle and smiling up at the patches of hollow-streaked snow that, even in late July and August, stand out on the tops of the Ballon d'Alsace and the Ballon de Servance, it is a lovely, long-to-be-remembered spot and every one in the Section quite naturally speaks of it as "home." We are billeted in some twenty-five households as if we were officers, although our rations are the rations of a common soldier and our Section rules are unfailingly to salute officers and even to make ourselves scarce in hotels and cafés frequented only by officers. Our lodgings range from hay-lofts to electrically lighted rooms; but the character of our welcome is always the same---pleasant, cordial, to be counted upon---" You are doing something for France and I will do what I can for you." One of the fellows, for instance, is quartered over a café. It is a little place, dirty and unattractive. Before the war an American tourist dropping into this cafë would probably have been sold a bad grade of vin ordinaire and been charged too much for it. But the other day the chap who is billeted there was a little under the weather and I took his breakfast to him in his room. I found the café full of customers who had not been served. The woman of the house was upstairs giving her ambulancier américain a cup of that great Vosges remedy, linden tea. I inquire' about lunch. But it was no use, there was nothing for me to do. She was going to fix him some lunch if he felt like eating it, and his dinner, too. Was not her husband away fighting and had not her eldest son been marked down as missing ever since his company took a German trench last June? Perhaps it is not surprising that we should be so received in a town where we have been living now for six months, where we are the best patrons of the biggest hotel, the most valued customers of half the shops. But this hospitable reception is by no means confined to our base. Everywhere we meet with a courtesy and with a gratitude which bring with them a very satisfactory sense of doing something worth while and having it appreciated. Imagine, for instance, a small town surrounded by mountains that, sloping gently up from its main street and railway station, are checkered for some distance with houses, green fields, and straggly stone walls, while hidden in their tree-covered summits are trenches and batteries of 75's, and here and there hotels where before the war tourists stopped and to which now the wounded are carried. But on this day a thick gray mist hangs over the town like a half-lowered curtain. The guns rest because the gunners cannot see. The mist hides entirely the tops of the mountains, gives the generally visible houses and stone walls a dim, unshaped appearance, and makes hardly noticeable a procession of gray motor ambulances coming out from the tree-line and making their way down into the town. Around the railway station is a group of temporary tents, where the wounded are given by the ladies of the Croix Rouge a cup of coffee or a glass of citron and water before being packed into the train sanitaire to begin their long journey to the centre or south of France. The ambulances evacuating the hospitals draw up among these tents under the orders of the sergeant in charge. Four or five French ambulances arrive and are unloaded. Then a smaller car takes its place in the line. It has a long, low, gray body with two big red crosses painted on either side. Beneath the red crosses are the words "American Ambulance," and a name-plate nailed to the front seat bears the words "Wellesley College." The driver, after clearly doing his best to make a smooth stop, gets down and helps in lifting out the stretchers. One of the wounded, as his stretcher is slid along the floor of the car and lowered to the ground, groans pitifully. He had groaned this way and sometimes even screamed at the rough places on the road. So the driver's conscience hurt him as he pulled some tacks out of his tires and waited for the sergeant's signal to start. It was his first day's work as an ambulancier. He could still see every rock and every rut in the last mile of the road he had just driven over and he wondered if he really had been as careful as possible. But he was saved from reproaching himself very long. An infirmier tapped him on the shoulder and, telling him that a blessé wished to speak to him, led him to one of the tents. It was the man about whom he had been unhappy, now more comfortable, although evidently still suffering. "You are very kind, sir," he said in English that might have been in other circumstances quite good, and disclosing a lieutenant's galons as he gave his right hand to the driver. "You drive carefully. I know, for I have a car. I don't like to cry---but I have two broken legs---anything hurts me---but it is really decent of you fellows to come way over here---it really is trop gentil . . ." And the driver went back to his car marvelling for the first of many times at the sense of sympathy which had made that pain-stricken officer think of him at all. One wet night not long ago, the writer was stopped en route by a single middle-aged soldier trudging his way along a steep road running from a cantonment behind the lines to the trenches. Embarrassed a little at first and pulling at his cap, this man said that he had heard in the trenches of the American Ambulance; that a friend had written back that he had been carried in one of them; that this was the first time that he had had an opportunity of shaking hands with one of the volontaires américains. Then, as I leaned over to say good-bye, he shook both my hands, offered me a cigarette, shook both my hands again, saying, "une jolie voiture," and, pointing towards where in the black distance came the rumble of guns, "Perhaps you will bring me back tomorrow." If that man, by the way, had asked me for a lift, as is usually the case when you are stopped like that on the road, my orders would have been to have refused him, to have said, "C'est défendu," and to have driven on. The Hague Conventions forbid carrying any soldiers in ambulances except those who are wounded and those in the service sanitaire. It is, putting it mildly, unpleasant to have to refuse a man a ride when he is wearily facing a long walk and you are spinning by in an empty ambulance. It is doubly unpleasant when you feel that this man would do anything for you from pushing your car out of a ditch to sharing a canteen. And yet, whenever we have to perform this disagreeable duty, the conversation usually ends with a "Merci quand même." Indeed, discipline in a French soldier seems to be able to maintain itself remarkably from within. Officers and men mingle probably more unrestrainedly than in any army in the world. A soldier when talking to an officer does not stand at attention after the first salute. Privates and officers are frequently seen in the same room of a hotel or café, and sometimes even have their meals in messes that are scarcely separated at all. But these encroachments upon military formalism seem to go no deeper than the frills of efficiency. Orders are obeyed without "reasoning why," and, as in all conscript armies, the machinery of punishment is evolved to uphold authority at all cost. Officers have wide and immediate powers of punishment, and the decisions of courts martial judging the graver offences are swift, severe, and highly dreaded. But, returning for the moment to Saint-Maurice, we park our cars in the public square, on a hillside, along the fence of the curé's yard and against the walls of an old church, where their bright red crosses flame out against the gray flaking stone, and, on a cold morning, it is always possible to save a lot of cranking by pushing them down the hill. About half the Section on any given day are to be found at the base and "in bounds," which means the square, the hotel where we have our mess, or the room where one is billeted. These men compose the reserve list, and are liable to be called at any minute when they must "roll," as we say, instantly. The rest of the Section are on duty in detachments of from one to eight cars and for periods of from twenty-four hours to a week at various dressing-stations, sorting-points, field hospitals, and so forth. The men on reserve are used to reinforce these places, to fill up quickly trains sanitaires, to rush to any one of a half-dozen villages which are sometimes shelled. Often, when the fighting is heavy, not a man or a car of Section 3 is to be found at Saint-Maurice. 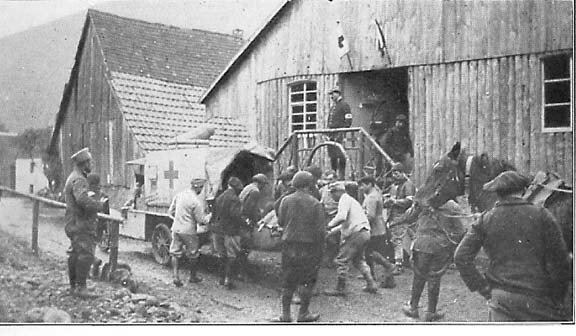 The repair car even will be driven to some crossroads or sorting-point where our ambulances bring the wounded from several dressing-stations. And Mr. Hill will be away in the staff car dropping in upon the widely separated places where his men are working to see that all is going well or to know the reason why. Mr. Lovering Hill, at the outbreak of the war, was practicing law in New York City. 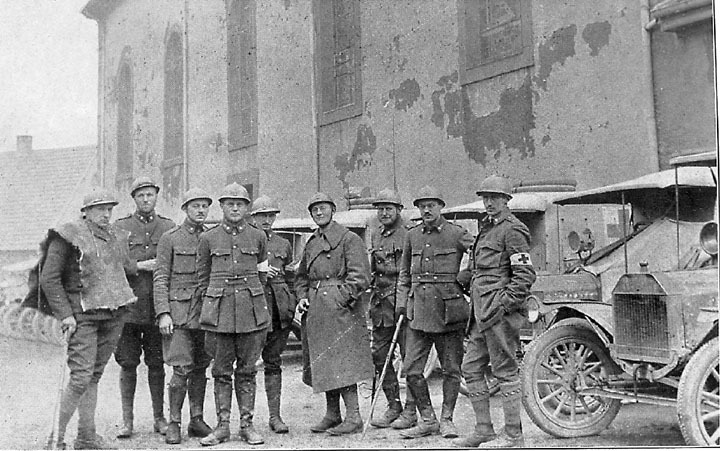 He had been educated at Harvard and in Switzerland, and, speaking French as well as English, and thoroughly understanding the French temperament and people, he immediately enlisted with the American Ambulance of Neuilly as a driver. In six months he was promoted to the rank of squad leader, and, since last July, ranking as a first lieutenant in the French army, he has been in charge of the work of Section Sanitaire N° 3, succeeding Mr. Richard Lawrence, of Boston, who had been compelled to return to the United States. Mr. Hill believes in never letting the reins of discipline drag, and yet he gets along famously with all except those who have a habit of recalling in some way that they are volunteers. A French lieutenant and an official interpreter are also attached to the Section. We are partly under the control of the Sanitary Service and partly of the Automobile Service. 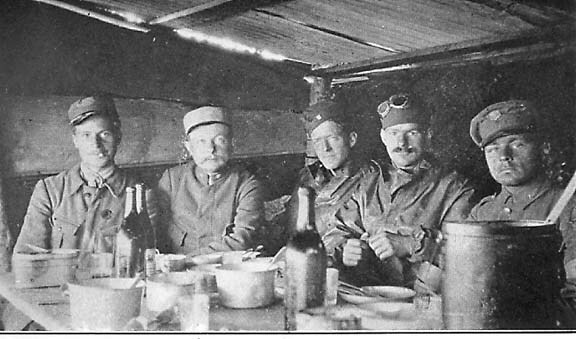 The French personnel are a link between the Automobile Service and our unit, and they are busy from morning until night keeping abreast of the required reports, for five-day reports must be made on the consumption of gasoline, the number of miles run, the number of wounded carried, the oil, carbide, and spare parts needed, the rations drawn, and, in great detail, any change in personnel. There are no orderlies or mechanics attached to our Section and each driver is responsible for the upkeep and repair of his own car. We do as much of this work as possible in the square where we park our cars. So we patch tires, scrape carbon, and change springs while the church bell rings persistently and mournfully for masses and funerals and while the people who sit and watch us from their shop windows laugh at our language as much as if they understood it. In general charge of this work and of a blacksmith shop that we have turned into a workroom is a so-called Mechanical Department composed of the two drivers who know the most about automobiles. And so successfully has the system worked out that, laymen though most of us be, none of our "Chinese Rolls Royces" or "Mechanical Fleas"---as an English Red Cross corps in the neighborhood has nicknamed our Fords---has been so severely "punished" that its repair has been beyond the power of its driver instructed and assisted by the Mechanical Department. We receive the one sou a day, which, in addition to allowances to wife, if any, and to children, if any, is the wage of a French poilu. We draw, as has already been mentioned, an ordinary soldier's rations: plenty of nourishing but rather solid bread, which, with the date of its baking stamped upon it, comes in big round loaves that we hold against our chest and cut with our pocket knife in true poilu fashion; rice or potatoes, generally rice; coffee, sugar, salt, and sometimes fresh meat, but ordinarily canned beef, called by the French private singe, or monkey meat. At our own request we get the cash equivalent of our wine and tobacco allowances, and this is used to help defray the expenses of having our food cooked and served in the best hotel the town offers. But with these exceptions---French tobacco especially may be put in the category of acquired tastes---we take and eat everything that is given to us with a very good grace. And although it is possible, especially at Saint-Maurice, to add variously and cheaply to this diet at one's own expense, it probably is a fact that those of the Section who, in a spirit of "playing the game" all the way through, have stuck to the rations weigh more and feel better than when they first took the field, in spite of the constant drenchings one gets and the stretches of work without sleep. The hours of our meals---served by the untiring, red-checked Fanny---are a little more American than military for those taking their turn on the reserve list "at home." But Mr. Hill's rule requires military punctuality on penalty of washing the dirtiest car in the square. This is also the punishment inflicted upon any one who does not get his car properly ready for morning inspection, who is not in his room by nine o'clock, who has any trouble on the road from an insufficient supply of "gas" or oil, who is tardy in handing in reports, or breaks in any way the rules from time to time posted in the messroom. "In a word, you are military and not military, but I am going to pay you the greatest compliment in my power, by treating you as I would any French soldiers under my command," the Commandant in charge of the Automobile Service of the army to which we are attached said to us on one occasion. And it has been the clear purpose of our two chiefs ---first Mr. Lawrence and now Mr. Hill---to live up to the responsibilities of that compliment. This is mainly done by example and through the force of a very real esprit de corps, but washing another man's car has been found a useful daily help for daily disciplinary needs. Away from our base, in our nomadic dressing-station-to-hospital existence, we are often pretty much "on our own." This part of our life begins in a valley reached through a famous pass. Starting from the valley of the Moselle easy grades along a splendid highway crowded with trucks, staff cars, wine carts, and long lines of yellow hay wagons, bring one to a tunnel about three hundred yards in length. In the middle of this tunnel is a low white marble stone with a rounded top that until a year ago last August marked the boundary between France and Germany. To an American driving an automobile in the dim tunnel light this stone is simply something not to be hit. To the French who have fought so bravely that it may no longer stand for a boundary it is a sacred symbol. I have seen the eyes of returning wounded glisten at the sight of it. I have heard companies of chasseurs, as they passed it going to the trenches, break into singing or whistling their famous Sidi-Brahim march. Beyond this tunnel the road, wrapping itself around the mountain like a broad, shining ribbon, descends into a fertile commercial valley in sweeping curves sometimes a kilometre long: on one side are high gray rocks where reservists seem to hang by their teeth and break stones; on the other, a sheer drop into green fields, behind the tunnel-pierced summit, in front the red-roofed houses of several Alsatian villages nestling against yet another line of mountain-tops. And along this road we have made our way at midnight, at daybreak, in the late afternoon, running cautiously with wounded and running carelessly empty. We are at home, too, in the villages to which it leads, with the life-size portrayals of the Crucifixion that are everywhere, even in fields and nailed to trees in the mountains, with the gray stone churches and their curious onion-shaped towers and clamorous bells. 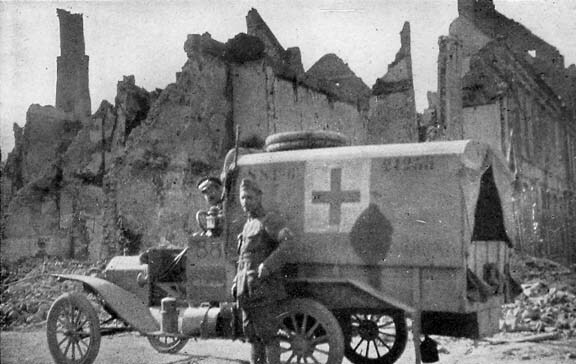 The appearance of an American Ambulance in the villages is no longer a novelty, sentries let us pass without a challenge, school children do not any more rush over to us at recess time, or soldiers crowd around us and say to one another, "voilà la voiture américaine." And we have friends everywhere: the officer who wants to speak English and invites us so often to lunch with him, the corporal of engineers who was a well-known professor, the receiving sergeant who was a waiter at the Savoy Hotel in London, the infirmier who was in charge of the French department of one of the largest of New York's publishing houses. But cooks are the people we cultivate the most assiduously. It is forbidden to leave your car and eat in a café. Besides, the time of day when we are hungriest is the time---maybe midnight or early morning---when no cafés are open or when we are marooned on some mountain-top. For single cars and small wandering detachments there are only informal arrangements for "touching" rations. So we depend upon the good-will of the chief cooks and we seldom go hungry. But the stanchest sustainer of every American Ambulance driver presides over the kitchen of the largest sorting-point in the valley. We call this cheery-voiced, big-hearted son of the Savoy mountains, who before the war washed automobiles in Montmartre, "Le Capitaine," "Joe Cawthorne," "Gunga Din." He is never tired or out of spirits. He never needs to sleep. It will be à rush period. We will leave our ambulances only to get gasoline, oil, and water while the wounded are being discharged. "Le Capitaine," too, will be up to his neck in work, cooking a meal for a hundred people, hurrying out at the médecin chef's order, soup for thirty and tea for twenty more---and still he will find time to run out to our cars with a cup of coffee and a slice of cheese. The only occasion on record of anything from "Joe Cawthorne" but a word and a smile of cheer was once when one of the fellows, who felt that to his coffee he owed his escapes from sleeping at the wheel and running off the bank, and therefore his life, returned to America, first giving "Le Capitaine" an envelope with some money in it. "Jamais, jamais," he said, returning the envelope and viciously picking some flies out of his coffe chaudron. There is no place like the front for the Long Arm of Coincidence to play pranks. I have known two university football stars to meet for the first time since their gridiron days on a shelled curve of a narrow road---each in charge of an ambulance and each down in the road driving some wandering cows out of their way. I have known two young men to celebrate the Fourth of July on their voyage over to do ambulance work, in a way that drew forth the gentle rebukes of a Protestant minister who happened to be a passenger on the same boat. They left him on the docks at Liverpool and, along with his advice, he passed out of their minds until two months later one of them met him in a general's car in Alsace. He stopped and told this fellow that he was preaching a series of sermons at the front and invited him to come and hear him the next Sunday in a near-by town, adding that among other things he thought he would touch upon the question of "War and Temperance." Speaking of the Fourth of July reminds me that on the national French holiday of the Fourteenth of July, I saw General Joffre in never-to-be-forgotten circumstances. He was spending this day in Alsace, and when early that morning I approached a little village in an empty ambulance, I was stopped by a sentry and, after being asked if I had wounded aboard, told that General Joffre was making a speech in the town square and that I would have to wait until he had finished before I could get through. a déjeuné dans cette maison. Le 15ième Bataillon de Chasseurs Alpins occupant cette région. Délivrée par lui le 7 Août 1914. Alsace has been for forty years German territory. For forty years young Alsatians have been forced to learn German in the schools, to serve in the German army, to be links in the civil and military chains which bound them to the Kaiser's empire. A few days ago I took the photograph of an Alsatian girl standing in the doorway of her home, which she said she was going to send through Switzerland to her brother in the German army "somewhere in Russia." But French hearts doubtless beat under many a German uniform, and those of us who have lived in Alsace are confident that re-annexation by France will not be a slow or a difficult process. Alsace has been tied to France by something which forty busy years have not found a way to change. The armies of the Republic have been received with an open hand and an open heart. I know of a fine field hospital organized and staffed entirely by Alsatian ladies happy to be nursing wounded French soldiers. I know of Alsatian boys, at the outbreak of the war not yet old enough to have commenced their German military training, who are to-day volunteer, and only volunteer, French soldiers. We have drawn our impressions of Alsace chiefly from five or six towns in a commercial valley. They are subject to long-range shelling and bombs dropped from aeroplanes. Indeed, my first day in Alsace was spent in the yard of a hospital contrived out of a schoolhouse. Our cars were parked beneath the windows of one of its wings, and all day long one heard the pitiful moans of a mother and her two little daughters who had been wounded the night before when the Germans had dropped half a dozen shells into the town where they lived. But these towns seem to be, on the whole, cheerful, prosperous places. Soldiers resting from the trenches flirt the time away with bilingual Alsatian girls. Horns, claxons, and the hum of motors make in the little mountain-smothered streets the noises of Broadway or Piccadilly. The cafés and stores are full from morning until eight o'clock, when all lights must be put out. Nothing is taken by the soldiery without being paid for, a fact that was brought sharply home to me on one occasion. We needed wood for the kitchen fire of a little dressing-station hidden on a tree-covered mountain-top. I picked up an axe and started to get some exercise and the wood for the fire at the same time; but the cook excitedly told me that not even in that out-of-the-way place, unless he had the proper military authorization, would he dare cut down a tree, because the commune must be paid for, every twig of it. But, interesting as these towns are, it is beyond them that we do our most useful work. I am writing, as it happens, at a dressing-station between the artillery and the infantry lines where two of our cars are always on duty. The driver of the other car, eight months ago, was in charge of a cattle ranch in the Argentine, and last May, a passenger on the ill-fated Lusitania, was rescued after four hours in the water. He is on his back tightening bolts underneath his car, and a hole in the left sole of his projecting shoes tells of hours with the low speed jammed on, for this is the way we have to drive down as well as up hill. We are at one end of a valley which, opening gradually, runs into the basin of the Rhine. Our two ambulances are backed up against a hay-loft dressing-station among a little group of houses frequently mentioned in the communiqués. At this minute the place is as peaceful as any Florida glade; it does not seem possible that war can be so near, so completely hushed. There is little military in the appearance of a few stretcher-bearers, dressed in the discarded clothes of peace, throwing stones into an apple tree; there is not a gun to be seen; there is not a sound to be heard unless you listen to catch the splash of a mountain stream or the tinkle of the bells tied around the necks of the cows grazing high up on a green but ladder-steep mountain-side. Coming down the road towards me is a little barefooted boy driving a half-dozen cows to where some girls are waiting in a pen to milk them. A little later, when my companion and I sit down to dinner with the young médecin auxiliaire in charge of the post, there will be some of this milk on the table. But long before dinner-time the whole surrounding aspect may change as if by black magic. Tree-hidden batteries, some only a hundred yards away and some on the tops of neighboring and surrounding mountains, may speak together with their "brutal lungs" until the echoes, rolling and accumulating, make a grand, persistent roar. 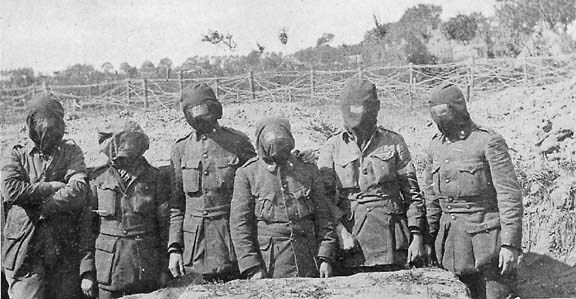 Even trench-weary soldiers will unconsciously duck their heads and stand ready to run to the bomb-proofs if the answering German shells begin to fall close to them. After dark the wounded will arrive, carried on stretchers, rested on men's shoulders, or pushed in wheelbarrows, to the hay-loft where a doctor, working almost entirely without anæsthetics, treats such cases as the doctors in the trench dressing-stations passed without attention. By this time also, on a night when many wounded are arriving, six or eight more American ambulances will be summoned by telephone. There will be no headlights used; only a great swinging of lanterns and much shouting back and forth in French and English. Although the firing after dark will not be so general, one or two batteries will continue to break out sharply every few minutes. One of our squad leaders will be on hand as driver in charge of the situation. "Are you ready to roll?" he will call to somebody as the doctor comes up and speaks to him. A dark figure standing by a car will lean over and spin a crank, an engine will sputter and pour forth smoke, for we must use a double supply of oil on these grades. Then an ambulance will back up to the door of the barn and the driver, leaving his engine throttled down, will help in lifting the stretchers. To go from this place to the sorting-point behind the lines to which the wounded are taken is the worst run we have. It means almost always wondering if your car will make the grades, if you acted properly in letting yourself be persuaded to take three wounded instead of the specified two. It means coming upon comrades en panne and lending a hand or hurrying on with the distress signal, stopping to pour water into your boiling radiator, halting to pass convoys, arguments, decisions, "noms-de-Dieu," backing to a wider place, wheels that nearly go over the edge, pot-bellied munition-wagons that scrape off your side boxes, getting into a ditch and having to be pulled out by mules or pushed out by men. It is a journey fraught with worry, for there is always the danger of delay when delay may mean death and is sure to mean suffering for the wounded in your car. And sometimes when, with bad cases aboard, you are stuck and can't get out until somebody turns up to help you, it is unbearable to stay near your car and hear their pitiful groans. But the down part of the journey is full of more acute dangers. You are at the mercy of your brakes. If they fail you, there is only the bank. A quick turn of the steering-wheel and you are all right; that is, there will be only a cruel shaking-up for the men you are carrying and a broken radius rod or perhaps a smashed radiator. But this is better than going over the bank and better than running amuck through a train of mules with their deadly loads of explosives. Only during the last two months have we been able to use the first ten kilometres of this road at all. Even now for the climbing part of the journey we take none but the more seriously wounded, leaving the rest to be carried in light wagons pulled by mules, until they get to some mountain-top relay-point where our cars are stationed. Most of these relay-points are very close to one or several French batteries. Some of them are established in the midst of thriving cantonments buried in the woods and within sight of the German trenches on a sister mountaintop. Others, farther removed from the enemy lines and higher above the level of destruction, are on summits suitable only for the biggest of the French guns and reached in turn only by the very long-range German guns. Such a place is a mountain-top at which we feel almost as much at home as at our base, for eight of our cars are always on duty at this place, each man serving for a week at a time, and one man being relieved every day. It is one of those plateau-shaped eminences which are mentioned in geographies as distinguishing the Vosges from the Alps and the Pyrenees. It is treeless through exposure to the wind, and its brow slopes gradually towards the French side, with a succession of cuplike hollows tenanted by brush-covered bomb-proofs and dugouts and horse-sheds. Other than topographical concealments are also employed; gray horses are dyed brown and groups of road-builders when at work in some particularly exposed place carry, like the army that went against Macbeth, umbrellas of branches. We are housed here in a long, low shack built against the side of the crest. Violent storms sometimes take the roof off this shack with the consequent drenching of the surgeon in charge, ourselves, a half-dozen stretcher-bearers and as many mule-drivers. Bunks are built crosswise against the side of the walls, and over some of these bunks the words "Pour Intransportables" are written. The rest, however, are occupied by people on duty here, for it is merely a relay-point, and the wounded, unless unable to stand a further journey or arriving by mules in numbers greater than we can handle, are merely changed from one mode of conveyance to another and given such attention in passing as they may need. Generals, of course, stand for the "larger issues" of the war; it is their decisions that figure in to-morrow's communiqués. But at the front, doctors represent destiny in a much more picturesque way: it is no use putting these blessés in an ambulance; death will close over them quite as gently here as twenty kilometres farther to the rear. This man's rheumatism demands that he be sent to Lyons or Marseilles; that one has five days in a base hospital and is in the trenches for the next death revel. A businesslike surgeon pronounces his judgments in a ghastly poste de secours,---it is nothing compared with "strategical necessities,"---it will have no place beside announcements of yards of trenches taken and yards of trenches lost,---and yet, it is life or death for some brave soldier and all in the world that counts for some family circle. These mountain-tops are often for weeks on end bathed in a heavy mist varied by rainstorms. At such times when there is no work to do,---and very frequently there are no wounded to carry for twenty-four hours or more,---the surgeon, ourselves, the brancardiers, and the mule-drivers, close in around the stove. One of these brancardiers, or stretcher-carriers, was transferred after being wounded at the battle of the Marne from the front-line troops to the Service Sanitaire, and before the war he had served five years in the Foreign Legion in Africa. His stories of this period are endless and interesting, and, after listening to them for a week, we all go back to our base calling soldiers nothing but poilus; coffee, jus; wine, pinard; canned beef, singe; army organization, système D. There is also a good deal of reading done by many of the Section on the rainy days of no work. It is part of the daily relieving man's unofficial but well-understood duties to bring along any magazines and newspapers that he can get hold of, and generally, too, books gradually accumulate and grow to be considered as a sort of library that must not be taken away. Indeed, at one poste de secours our library consists at present of two or three French novels and plays, "The Newcomes," a two-volume "Life of Ruskin," "Tess of the D'Urbervilles," and "Les Misérables." 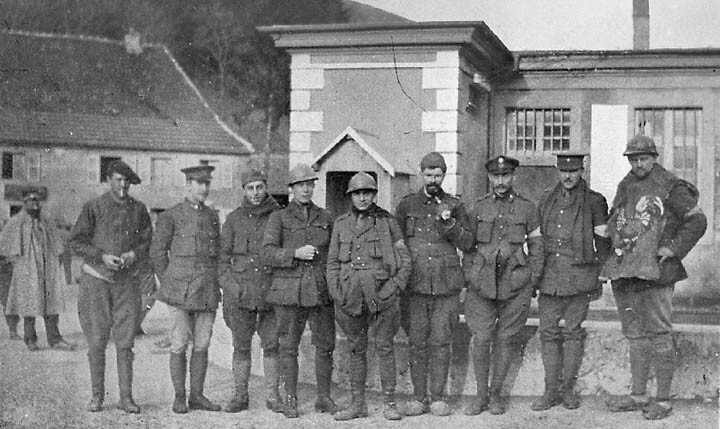 When a group of men are on duty at an isolated poste de secours like this, they take turns in carrying the wounded who may arrive, the man who has made the last trip going to the bottom of the list. And there is something comfortable about feeling that you are the last to "roll" on a stormy night when every plank in the little hut rattles and groans, when the wind shrieks in the desolate outside, when the sinister glare of the trench rockets gleams through the heavy blackness like a flash of lightning, and the wet mule-drivers who borrow a little of your fire shake their heads and pointing towards the road say, "Un mauvais chemin." And then, as you settle a little deeper in your blankets and blow out your lantern and assure yourself for the last time as to where your matches are and how much gasoline you have in your tank, you are pretty apt to think, before you go to sleep, of the men a little way off in the rain-soaked trenches. They are certainly not very far away. Only over there on the next ridge where the shells are exploding. They have been there, you know, without relief for ten days. You remember when they marched up the mountain to take their turn. How cheery and soldier-like they were! Not one of them, like you, is sleeping in blankets. They won't, like you, go back to-morrow to a pleasant dinner, with pleasant friends, in a pleasant hotel, and out of sound, too, of those awful guns. Some will come back and you will carry them in your ambulance. And some will never come back at all. Well . . .
"Did I leave that spark-plug wrench under the car? God knows I can never find it on a night like this and I change a plug every trip!" "Wake up! Don't talk in your sleep!" "What, is it my turn to roll? Wounded?" "No, Steve is en panne halfway down the mountain." And you begin to take things in with one of the Section's sous-chefs leaning over your cot with the news that the first man on the list has a load of wounded and has met with an accident. The others are waked up too. Some are left to take care of such other wounded as may arrive and the rest form a rescue party. Two ride in the rescue ambulance; two more probably walk. The wounded are moved from the broken-down car to the other ambulance, and then daylight finds three or four of us rain-drenched and mud-smeared, changing a brake-band or digging into a carburetor. The arrival of the relieving car at one of those posts on a rainy day, when every one of us is to be found within twenty feet of the stove, means a demand in chorus for mail and after that for news, especially Section gossip from Headquarters, which means who has had to wash cars and who has broken down en route. "Number 52 runs like a breeze now. I drove it yesterday and it climbed the col on high with two wounded," the newcomer will say, producing some contribution to the mess. "And last night, there was a call for three cars at midnight. Did n't any of the wounded come this way? So-and-So had magneto trouble bringing back his first load. He said Henry Ford himself could not have started the boat. So the repair car went out at four o'clock this morning." "That boy certainly has his troubles. Do you remember the time he had two blow-outs and four punctures in twenty-four hours and then had all his brake-bands go at once ? It was two miles he ran to get another car to take his wounded." "He looked low when he came in about breakfast time," somebody else will put in. "I tell you he will use too much oil. It goes through these old cars like a dose of salts," a third will add. On bad days the discussion will go on this way until time for the next meal. But on clear days during summer and early autumn weather, we have stayed indoors very little. The air is champagne-like and the view on all sides magnificent. It is possible, also, from a number of these eminences to follow in a fascinating fashion the progress of artillery duels, and, with a good pair of glasses, even to see infantry advancing to the attack. When the cannonading is heavy the whole horizon pops and rumbles and from the sea of green mountains spread out before you rise puffs of shrapnel smoke, flaky little clouds about the size of a man's hand and pale against the tree-tops, as one thinks of death as pale. They hover, sometimes too many at a time to count, above the mountains and then sink down again into the general greenness. The sky, too, is generally dotted with these same little flaky clouds when aeroplanes are abroad. And aeroplanes are abroad every fair day, for they are seldom or never hit and brought down, although the anti-aircraft guns, especially when hedging them in with "barrier fire," seem to limit their activities. Soldiers, as I have said, march by these posts on their way to and from the trenches. Whenever they are allowed to break ranks near our cars they crowd around us with little bottles in their hands asking for gasoline to put in cigarette lighters which they make out of German bullets. Most of these men belong to battalions of Chasseurs Alpins, and I do not suppose there are any finer soldiers in the world than those stocky, merry-eyed men from the mountain provinces of France, with their picturesque caps and their dark-blue coats set off by their horizon-blue trousers. 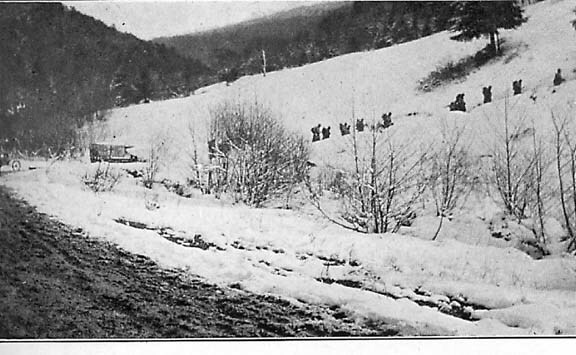 They are called, indeed, the "blue devils," and when the communiqué say, "After a heavy shelling of some of the enemy heights in the Vosges our infantry advanced to the attack and succeeded in taking so many of the enemy trenches," it is probably the Chasseurs Alpins who have led the way in the face of the hand-grenades and machine-gun fire and the streams of burning oil that, in this country especially, make the "meaning of a mile" so terrible. One of our Section who was compelled to return to America the other day took with him as his single keepsake a crumpled photograph with a signature scrawled in one corner. It was of a sous-officier of famous battalion of Chasseurs Alpins. His heavy pack was jauntily thrown over his shoulders; his beret was rakishly tilted to one side; and on his breast gleamed the green and red ribbon of the Croix de Guerre, the crimson of the Légion d'Honneur and the yellow of the Médaille Militaire. You could find no better symbol of the laughing, gallantry, the sturdy strength, and the indomitable courage of France. 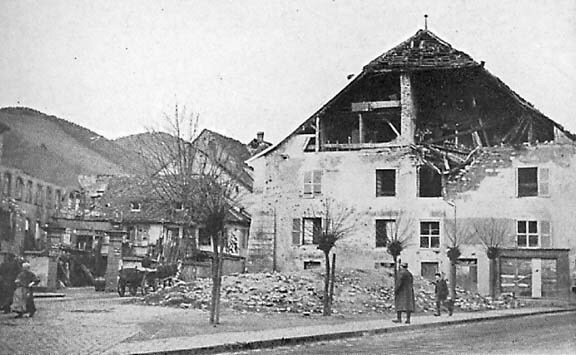 "The Last Days in Alsace,"
BY December 20, the approximate date of the beginning of the French attack upon the German positions on Hartmannsweilerkopf, the headquarters of Section 3 of the American Ambulance had been moved temporarily to a place called Moosch. 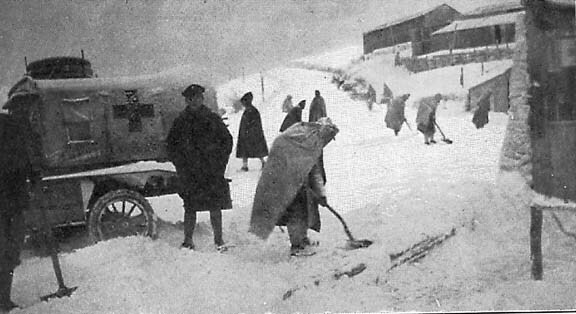 Here was located a large modern hospital to which the wounded were brought from the dressing-stations in the mountains, two or three kilometres behind the lines of advance trenches. From this hospital the blessés were moved into the interior as fast as their condition would permit. 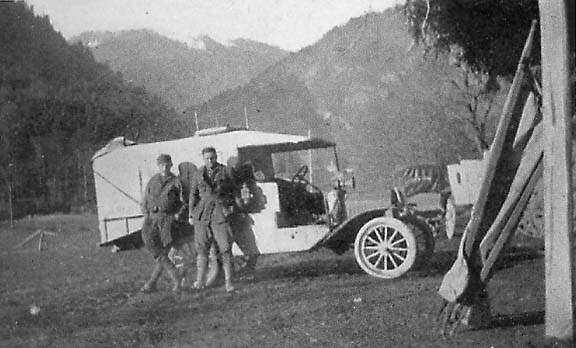 It was the duty of the small American Ford ambulances to bring the wounded from these mountain stations down to the hospital at Moosch. Moosch, a typical Alsatian town, consisting of a few large buildings, the "Mairie," the church, a hotel or two, and perhaps a weaving mill, about which are clustered the homes and stores and cafes or combination of these latter, is situated in the valley of the river Thur. This valley runs up, and west or slightly north of west, to the divide, between the Moselle River and the Thur, this divide making the old boundary between French and German territory; and down in a south of east direction until the mountains end and we enter the plain that forms part of the drainage basin of the Rhine. Moosch is about halfway down this valley and about twelve kilometres from the front, which was on the last row of hills before the beginning of this plain. The valley itself ranges from one to two kilometres in width and the green forest-clad mountains rise on each side to a height of three hundred to four hundred metres. In the floor of the valley were orchards, open fields, and small towns. Down the centre of it was the broad road which continued up and over the divide into France. It formed, aside from an aerial tramway that the French constructed over the divide especially for this war, the only avenue of traffic for the supplies of ammunition, guns, food, etc., for the armies that were situated in this district. As a consequence it was night and day a scene of activity throughout its entire length. Down the valley this road had two important branches, one at a point six kilometres from Moosch and another at eight. 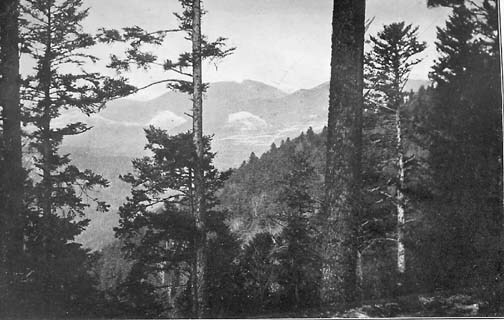 Both these branches followed the course of small creeks that feed the river Thur, up and up the small valleys through which the streams flowed, then turned up the mountain-side and climbed to the top of one of the larger hills. 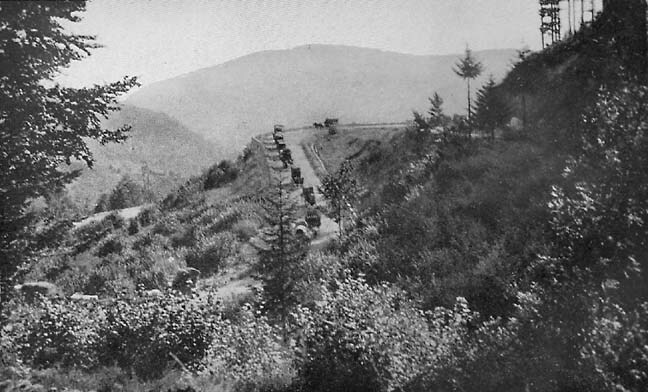 One route was used for traffic ascending, the other for all descending, except for any that was required by Red Cross Stations or artillery posts along the way. In this manner much passing of the up and down streams of wagons, mules, motor trucks, etc., which would have been well-nigh impossible on these steep, narrow roads, was avoided. On the mountain-top was a small space, somewhat cleared of the forest growth, where three roads met, two that have already been mentioned and another that went over one shoulder of the mountains and down to an advance poste de secours, practically under Hartmannsweilerkopf itself. In one angle of the "Y" formed by these roads were a few roughly constructed buildings for taking care of the wounded, cooking, etc., and in another nothing but the steep slope of the mountain with a cabin or two tucked close against it amid the pine woods. In the last angle was a small graveyard where lay the men who had died from wounds there at the station or had been killed during the bombardment of some local artillery post or of the road. Next to this graveyard was a limited parking-space for the ambulances, and beyond this the cosy little building, the poste de secours, where the French stretcher-bearers and American drivers ate and slept together when not at work. This place was popular among the Americans, at first, at least, before the Germans captured a colonel with telltale maps upon his person, and their guns began to find and make uninhabitable a spot that had once seemed a secure retreat. Up in the fresh air and ozone of the pine woods, it was hard, in spite of the graveyard near by and the ever-passing stream of ammunition wagons or pack trains, not to think of this place as a pleasant vacation ground. The Frenchmen, too, were wonderful companions, playful as boys of ten, and kind and generous to a fault. After a snowstorm, unless there was a great deal of work, there was sure to be a tremendous snow battle in progress, and the Frenchmen, old territorials some of them, forty to fifty to sixty years of age, would be as hard after one another as boys in their mimic wars. Their generosity went so far as surrendering their bunks to the Americans while they slept out in the ambulances. At times the little poste de secours would be a scene of revelry, the professional entertainer taking part in the programme of the evening with the country songster. More often, however, the Frenchmen were busy and the Americans would amuse themselves with some deep, protracted argument or read the latest book on the war that some kind friend had sent to a member of the Section. At night the little hut had its bunks filled to overflowing, but sleeping was generally good, unless your bedfellow happened to be a soldier dreaming of battle or a mule-driver dreaming of swearing at his mules. At night there were always one or two interruptions, especially whenever an ambulance driver was wanted. Those who were sent to call him always succeeded in waking the whole lot of sleepers before finding the man whose turn it was to "roll." This "night rolling," as it is called, is not the easiest thing to do by any means. The road, steep and narrow and rough at any time, would in snowy or rainy weather cause an occasional sinking of the heart to the best of drivers. To these difficulties was added the necessity of passing the slowly descending trains of ammunition wagons and mules. On one stretch of road no lights were permitted, as they would have disclosed its location to the Germans. On nights when there was no moonlight and heavy mists enshrouded the mountains, it was a trying nerve strain to come down this bit of road. The history of every car would be full of stories of narrow escapes from running into wagons, mules, or men, or running over the edge of the road or against the side of the hill. These difficulties and trials, however, were n't what would occupy the mind when the German shells began breaking near; they lose their importance entirely. One can get used to the blind driving on a dark night, but never to the high-explosive shells. Even on the floor of the valley where the road is level, the thrills might not cease, for here it has been a common experience to run into an unlighted wagon or to be smashed by a heavy, ponderous motor truck. Perhaps it would be a mere matter of getting ditched in the effort to get out of the way of the latter. But with the Ford this was never a serious trouble, as eight or ten men, and they were always to be had in a few moments on any part of the road, could quickly lift it out and put it on the road again. Out of the most severe smash-ups the Fords have emerged supreme and in every case proved the statement that a "Ford car can be bent but not broken." At the hospital the wounded would be taken out, new blankets and stretchers put in, the gas tank filled, and the car sent up the mountain again to wait for more blessés unless it was time for the driver to turn in and get a bit of sleep. During the day a call would very often mean a trip down the other side of the mountain to the advance posts nearer Hartmannsweilerkopf. While day driving has n't the terrors of night driving, yet the road near these two posts and the posts themselves were more often the object for German fire, and it was with a little feeling of dread that one went there. The road down to it was exceedingly steep in places and few cars could make the return trip with a full load. There never was any anxiety about stalling, however, for a little assistance from eight or ten soldiers would send the car on its way again. Many a time a driver would unconsciously arrive at the posts at a time of bombardment and be told to leave his machine and hurry to an abri. An abri is a cave or dug-out in the side of the mountain offering protection against the German shells. All along the mountain roads these little places of refuge began to appear after the Germans had learned how to drop shells consistently near these routes, and to see them thus was a real comfort to the mind whenever the whistle of a shell sounded unpleasantly loud and near. These caves were not always in a finished state, as a big broad-shouldered driver learned to his discomfort and the vexation of his two comrades. They were taking a look at Hartmanns from a portion of the road whence it can be seen, when the portentous sound of the flying shells began which kept coming nearer and nearer. The Americans turned and ran up the road to one of these abris, the big man leading. He darted for the cave entrance, but his body was just too big and he was wedged tightly between the stone sides, while his two comrades pounded on his back clamoring for admittance. He decided it was more comfortable and safe flat against the rocks in front of the car, and safer, too, than in a hole the entrance to which might so easily be closed. One was not always compelled to be conscious of such unpleasant things as bursting shells. At slack periods when neither side was firing, and the traffic was not too heavy up and down the roads, the trip up and over the mountains could be one of the pleasantest of rides. Sometimes after a snowstorm the mountain forest scenes were magnificent, and there was the occasional wonderful expanse of view over valley and plain below. Away off on the German side could be seen the town of M---- which was brightly illuminated at night. The Germans seemed indifferent to the fact that these lights were a great temptation to the French gunners. As far as known, the latter seldom yield to this temptation to bombard civilians despite the fact that the Germans were shelling towns, needlessly it seemed, in the territory held by France. Many pleasant rides after the attack, in the warm sunshine of the spring days that came in January, will stay in the minds of the drivers, a contrast to the rushing trips taken in slush and mud and snow during the height of the attack. The time spent in Moosch at the hospital was nearly always a period of activity and interest. There were sure to be minor repairs needing attention, tire-changing to be done, and often more difficult matters to attend to, such as eliminating the knock in an engine, changing brake-bands, or putting in a new rear axle. The hospital itself looked across the valley to the hills beyond, upon one of which was anchored a small sausage-shaped balloon, such as is used all along the French line for observation purposes. One hundred metres back of the hospital rose the hills forming the other side of the valley. On the slope of one of these was the rapidly growing graveyard where the bodies of the soldiers who had died at the hospitals were laid. Among them was the body of Richard Hall, the young American ambulance driver who lost his life during the attack, when his machine was struck by a shell on the road up the mountain. On the east side of the hospital passed a small road that led up to the graveyard, and beyond this was an open field where an aero bomb fell with disastrous results to one fowl and to the windows of the hospital on that side. In the hospital yard on this side were put the ambulances needing repairing, and in rush times part of the other side of the yard was also required. Here was rather a good-sized building, the front end of which was the morgue and the other end the laundry. Behind it was a small shelter where the bloody stretchers were cleaned. It was in these surroundings, with the rows of coffins on one side and the stretcher-cleaning on the other, that much of the repair work was done during the height of the attack. Here, too, would form the military funeral processions that went with the bodies to the graveyard on the hill. Two funerals a day of one to five coffins was the regular schedule in the busy days of the attack. One of the most intensely interesting sights was the gathering of the whole regiment, of those who were left after the attack, about this graveyard to give a last formal salute to their departed comrades. Hardly a day passed during the period of the attack when the village was not shelled, and when it was clear, the German aeroplanes would appear and drop their bombs or smoke signals, or seek to destroy the observation balloon of the French, descending as near to it as they dared. One of the prettiest sights of the war is to see the little tufts of cloud appear near the course of the speeding machine whenever the shrapnel bombs burst. 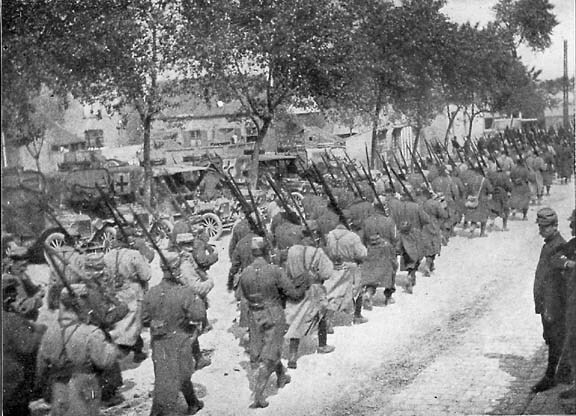 The clouds formed by the French shells are white, by those of the Germans, black. It was surprising how difficult it seemed for gunners to get anywhere near the aeroplanes. They would pepper the sky in every direction except near the moving spot they were trying to hit. At rare intervals both German and French machines were up, and their manoeuvering for an advantage was always interesting. The interest, however, in this sort of thing changes after a few bombs have been dropped and their terrific effect seen. Such is the general story of the activity and life of the Section's last months in Alsace. Its details would include many stories of tight squeezes, of break-downs and troubles in hot places, of the carrying of soldiers driven mad under the strain of war, of having men die in your car on the way to the hospital, of short side trips right up amidst the French artillery stations, and always of the patient, quiet suffering of the French soldier. There would be stories of the days when the car would have "moods," and refuse to make the grades as it ought, and then again of times when nothing was too much for the engine to do. After the attack we were moved from Alsace farther inland, and after some wandering from place to place through a country that had been the scene of much fighting in the earlier part of the war, and through villages almost completely destroyed by the Germans, we were sent to a town near Nancy-Tantonville to do ambulance work for the hospitals situated within a twenty-five-kilometre radius and to wait until our cars could be overhauled and repaired. Note: This Section subsequently rendered heroic service in the great battle of Verdun, and has since been sent to Salonica to serve with the French army of the Orient. (November, 1916).